You already know my frustrations with germaphobes, especially those of the mom variety. 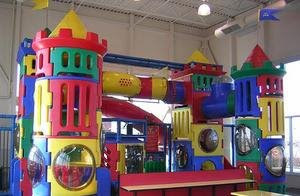 What is it with the moms who freak out about indoor playlands. #1 - If you are going to stand there with your lip curled like you are releasing your kids into a petri dish - then go home! #2 - When you harass your kid to keep their socks on, its so annoying. Do you know how hard it is to climb up the slide with socks on? And climbing up the slides is arguably the most fun thing to do an indoor playland (just ask any kid). And what is the point?? Protect their feet from germs?, scrapes?? Their bare hands are all over the equipment as it is -- who cares about the feet? #3 - My biggest pet peeve is the parents who whisper to the kids "just leave your shoes on" Nice one mom, your precious kids pinkies will be protected from whatever while they crush my kid's fingers with their shoes. And I firmly stand by my "germs aren't all that bad" theory. My kids are way less sick than all the freak out about germs crowd. I so totally agree. I was more of a germ-a-phobe with Ty and he gets sick more often than the other two. Amen sista! Seriously, my other issue is the moms that have the shopping cart covers for their kids...never once have I thought that was important! I love hearing your opinions. I took my babies out days after they were born. They rarely get sick. And after visiting those places, I think a little hand sanitizer goes along way. It's not that the germs gross me out, it's watching kids pick their nose, ears, mouths, butts, scabs, everything and then wiping it to and fro and touching everything like kids do that makes me squirm. A crunchy mom's reversal on vaccinations. My Life in Words, Part One: The changes in her body. Weight watchers... doesn't work, just to clarify. Shall I say goodbye or see ya later gator? What's another word for thesaurus? What is This "Blogging" You Speak of? "FUN: a gleam in the eye, reflected in the faces of others."